As the youngest member of The Irascibles, Theodoros Stamos developed his artistic style during the highpoint of Abstract Expressionism. His style changed dramatically during his career, beginning with biomorphic forms and later advancing into pure color abstraction. His adventurous approach, transient style and expressive color palettes give credit to his association with the Abstract Expressionists and reign him in the top ranks among his contemporaries. His ingenuity is most expressive in his works which create the effect of luminosity using a medium that is, by definition, opaque. Born and raised in Manhattan, Stamos sought refuge from the stark and vapid environment in the Museum of Natural History. The fossil, mineral and single-celled organism exhibits both intrigued and perplexed him. With an affinity for nature and its biomorphic components, Stamos created his earliest works as a metaphor for the world he saw before him; one of simplicity forever lost in the hurricane of complexity. 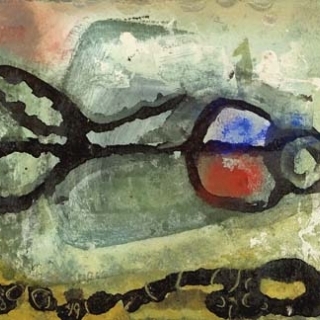 Between 1949 and 1955, Stamos’ works were juxtapositions of “shadowy presences, translucent hazes, and delicate calmness alongside the encroachment of an orientalizing type of calligraphy”. (Knoedler Zurich Catalogue: Stamos) These works have a delicate soft side to them; their brushstrokes are graceful and lyrical and their palettes hold a melancholic weight to them. Stamos’ later works are explosive in color and in size. Their initial impact is one of strength and dominance, yet at closer observation they are filled with endless ambiguities and uncertainties. Stamos’ career as an artist has proven to be extremely successful, despite the changes the art market has undergone over the past decades. The irony in his work is not accidental, it is reasoned through by concrete means and as a result it reflects a sense of solidity. The true testament to Stamos’ world, whether imaginative, tangible, explosive or subtle, stems from the natural world of chaos and order. Stamos’ works are in more than forty-five museums and numerous private collections. © 2008 Levis Fine Art, Inc.